You’ll not see this pigeon flapping around town centres eating rubbish and defacing statues unless, that is, the Canadian eight-piece were sampling a Saturday night out in Britain. One listen through Treasury Library Canada suggests, however, that they would have more sense. More of a collective than a band (eight regulars, many occasional helpers), Woodpigeon immediately steer away from the stereotype indie image. Adding to their uniqueness is the wide collection of instruments that feature in the group’s second full-length album. So vast is the musical ability of Woodpigeon that glockenspiels, flutes, violins, saxophones, banjos and mandolins are all potentially liable to making an appearance at any given moment, surprising you in almost every song. 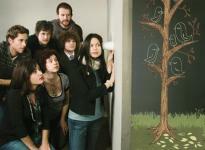 Treasury Library Canada is a folk-pop come indie hybrid with glimpses of country discreetly tucked away. Running throughout is a bittersweet theme with shady lyrics wrapped up warmly in beautiful sounding cotton wool. ‘Bad News Brown’ is a perfect example of the bittersweet premise - a dreamy track created with acoustic guitar and sweet backing vocals, all of which disguises the somewhat darker lyrics: "I don't want to leave the peace/For bad news brown/I go off insane/I blow up." The origin of the group’s name isn’t as deep; originating from frontman and founder Mark Hamilton with the rather playful reason that Woodpigeon "looks like a rollercoaster when it’s written in cursive." In sharp contrast to this, Hamilton goes on to say that writing the album has redefined his understanding of words like love, hope and home - his idiosyncrasies have certainly rubbed off on the finished product. ‘Emma Et Hamplis’ breaks the album’s mould slightly, with it’s raw and tin-like vocals. Once the violin intro finishes in ‘I Live A Lot Of Places’, a country style sound takes over and transforms it into a sprightly number. The rest of the tracks follow a loosely based rule of slow-paced and single instrument starts before leading gently into multi-instrumental, mid-paced climaxes. It’s an eerie yet intriguing album that can be difficult to place; it seems full of nostalgia and bitter memories yet has moments of warming sunshine where suddenly everything seems innocent and fulfilled. A bit of bird-research suggests you’re more likely to see the aptly-named Rock Pigeon meandering around the high streets, leaving the humble Woodpigeon nestling comfortably amongst tree branches in a semi-urban suburbia - an image that seems to fit just right.